Katniss Everdeen (played by Jennifer Lawrence) is the main character in the Hunger Games trilogy. 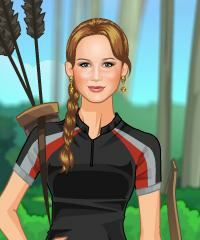 In this dress up game you can find all kind of outfits for Katniss for TV interviews, for training and of course for the actual Hunger Games themselves. Go Play for free online and have fun.